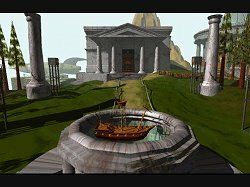 Even though Myst is six or so years old as I write this review, it's a daunting task to contemplate. It's daunting because this title takes the prize for being one of the best selling computer games ever, and it also holds the esteemed honour of being the single game that introduced a whole wave of new players to the delights of adventure games. At its advanced age it is still readily available in most computer game outlets and was recently distributed as a bonus offer along with the Legend title, John Saul's Blackstone Chronicles. Myst is a game of transient lands and of lonely exploration, discovery, and puzzle solving. Although the graphics are no longer state-of-the-art (they don't have the detail and clarity of Red Orb's latest offering, Riven) they still hold that magic and create a poignant 'other worldly' atmosphere where everything is mystical and mysterious. The eerie music heightens this atmosphere, as does the isolation and emptiness. Though there are no fancy transitions, only still landscapes to explore, the fascination hasn't faded. You start out on this first person journey as you discover a mysterious book. Open it and you'll be drawn into the pages and transported to an equally mysterious universe where greed and power have reaped their just rewards ... or have they? Of course you won't know what is happening until you look around and begin to work things out for yourself ... and I'm not going to spoil it here. Before you is a stark, beautiful world to explore where you have to rely entirely on your own resources. There are no game characters to offer help, only a small library, a few scattered notes, and an assortment of tantalising mechanical devices. Your aim is to operate these devices after which you'll be transported to yet more worlds equally as fascinating as the first. Myst is a mouse-driven game with a small, pointing hand cursor for navigation that changes shape to an open hand for operating objects. There is no inventory, as you don't need to collect more than one item at a time. The in-context puzzles are mostly of the mechanical variety where you must carefully survey your environment and experiment to make things happen. Contrary to some popular misconceptions, Myst is not based on a collection of abstract/logic puzzles such as sliding tiles and the like. Even the cog turning puzzle is a 'fraud' in this respect once you figure it out. It's a journey where you will be faced with a variety of knobs and dials and buttons, and determining how and when to operate them is the tricky part. There are many clues strewn throughout the gameworld and many of the problems are aural-based so I must stress that Myst is not a game for hearing impaired players. Musically-challenged players like me who can't possibly reproduce a musical note after 5 seconds delay will find one of the puzzles very tough. This is my second bite at the Myst apple and I enjoyed it every bit as much as the first time around, maybe even more so. It's a game for players who appreciate solemn, solitary exploration and interpreting everything seen and heard in the gameworld, rather than (or as well as) running around and collecting items and chatting to game characters as in a traditional inventory-based game. It's a controversial game in that it has many, many admirers, but also a lot of detractors who prefer the latter type of adventure. Whatever you hear about it, the best advice I can offer is to try it for yourself and make up your own mind.